Back in 1996, when Suchitra Raghuraman joined Wipro Technologies, the information technology arm of Wipro Ltd, India’s third largest software services firm by revenue, as a fresh graduate, she knew that her no-frills BSc degree would not take her far. So she simultaneously signed up for the integrated master’s of science (MS) programme in computer science offered by her employer. “When I juggled both study and my work successfully, it sent out a signal that I was capable of doing both well," said Raghuraman, now a delivery manager at the company who frequently travels overseas to meet clients. “It makes an impression." It isn’t just Raghuraman. At Wipro Technologies, around 5,000 employees are balancing work and study in a bid to bolster their careers. Termed the work-integrated learning programme, it offers graduates with a basic degree in science an opportunity to earn a master’s degree in engineering and equip themselves with the necessary qualifications in an industry dominated by engineers. Similar strategies are being adopted by employees elsewhere and companies are making efforts to help upgrade their skills. Texas Instruments (India) Pvt. Ltd, or TI India, encourages employees who have put in two years of service at the company to register for an MS (microelectronics) programme, offered by the Birla Institute of Technology and Science (BITS), Pilani (Bangalore extension centre). “For those who do not have a BE (bachelor of engineering) degree, the five-year course work offers an integrated bachelor’s and master’s programme," said C.P. Ravikumar, director, university programmes, TI India. He said the company has worked out a similar arrangement with the Manipal Institute of Technology. TI India executives “often conduct classes for the employee-students on request from the institute", said Ravikumar. At the Indian arm of International Business Machines Corp. (IBM), which offers employees a chance to acquire a four-year programme in software engineering from a slew of institutes, such as the University of Mysore and Vasavi College of Engineering in Hyderabad, “the curriculum of the course was designed and developed jointly by the universities and IBM", said Madana Kumar, learning leader, IBM India, South Asia. For the online learning programmes, the employee students collectively take a decision on exam dates and attend faculty-led sessions on weekends at company premises. “This programme plays a significant role in helping IBM tap a fresh talent pool and in retaining employees for a longer period," said Kumar. It is a strategy that is seen as a response to a critical gap in the executive talent pool across Indian companies. “There is a serious shortage in middle management talent; this segment is close to absent in India currently," said Yeshasvini Ramaswamy, managing director, e2e People Practices Pvt. Ltd, an education management consultancy. She feels that as the average age of senior executives across Indian companies drops from the earlier median age of 50 to 35, there is not enough being done to prepare managers adequately. “Work-integrated learning is an attempt to bridge this gap and offers companies an excellent return on investment." Typically, companies either fully fund or partially fund such learning programmes. “Any academic programme which is in line with the current or future job role of an IBMer is part-funded by IBM. Before enrolling, the aspiring IBMer has to take approvals and the course fee is budgeted within the department funds," said Kumar. 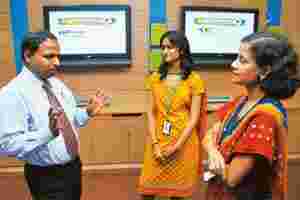 In the case of Wipro Technologies, the programme is wholly funded by the company, but participants are evaluated closely. Failing in even one course means a move to a performance monitoring programme. “We have so far seen a failure rate of just 1% amongst all participants," said Selvan D., senior vice-president, talent transformation, Wipro Technologies, who says the attrition rate among this set of employees is a low 5% compared with a companywide average of 12%. Companies are also working towards helping senior executives enhance their skills. For senior executives, information technology-enabled services firm IBM Daksh Business Process Services Pvt. Ltd has a self-paced online MBA programme in partnership with Northeastern University’s College of Business Administration, Boston. Senior managers at the middle management level can enrol for an accelerated management programme conducted in partnership with Management Development Institute (MDI), Gurgaon. “These initiatives are unique in the sense that they have been developed as collaborative efforts between IBM and leading institutes and organizations in India and abroad," said D.P. Singh, director, human resources (HR), IBM Daksh. Mid-tier companies in the information technology sector are following this model of talent development. For instance, Nucleus Software Exports Ltd, a software product firm, offers an on-campus MBA programme for senior executives in collaboration with the Institute of Management Technology, Ghaziabad. “As a product management group head, studying for a formal MBA course has provided me with a solid theoretical framework for decisions otherwise taken based on experience," said Kamal Nayyar, assistant vice-president, product management group, Nucleus Software. At IBM India, an ongoing partnership with top global universities such as Cornell University and Duke University in the US and Indian Institute of Management, Ahmedabad, is aimed at developing top leadership talent such as potential directors and vice-presidents. “This branded programme called Bright Blue helps IBM enhance its top leadership pipeline and prepares many from India for global leadership roles," said Kumar.